Manufactured in Allemagne from 1977 until 1979. In the order of presentation, the EK8 was the third model with instantaneous developing system expansion offered by Kodak. 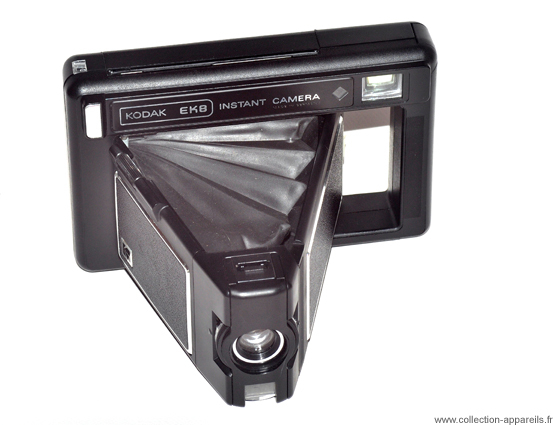 The official launch was done in Cologne, at the time of Kina of 1976, whereas Polaroïd had already started, in Boston, some prosecution against Kodak for failure to respect of the patents. Contrary to the first two models, this one is folding and reminds, by its shape, some very former folding cameras. The kinematics of the deployment of the bellows is like the camera is equipped with a handle for the taking of views. Focusing is done thanks to a coupled rangefinder. The exposure is automatic and is regulated by a Silicon exposure meter. A red signal turns on in the viewfinder when the lighting conditions are insufficient. It is then necessary to use a flip-Flash. The ejection of the photograph is automatic, insured by an electrical motor. The size of the photographs is 9.7 x 10.2 cm, but the image measure only 6.7xX 9. Its sensitivity of film is approximately 23 DIN.